The RhoMobile Suite allows the development of apps that can run on multiple mobile platforms from a single code base. In essence, these apps employ a web-like front end that renders on a platform-specific webkit, which passes device calls through to the underlying hardware. RhoStudio also can build native apps for Android, iOS and Windows Mobile and Windows Phone 8 using the corresponding SDK(s). 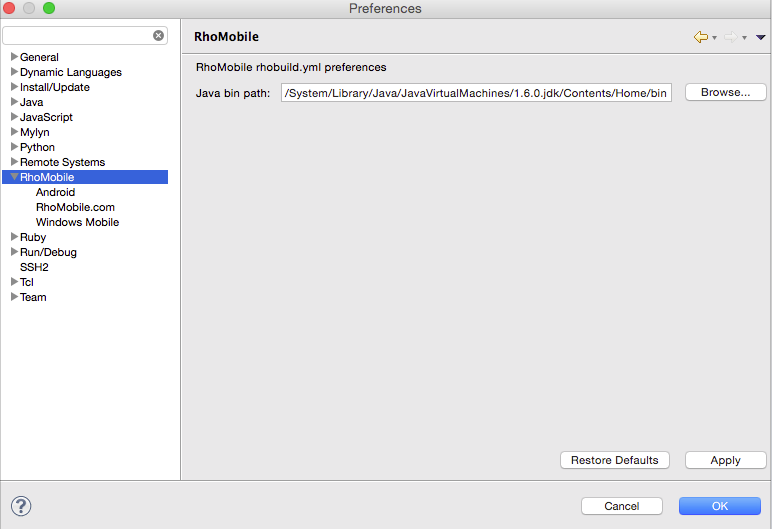 At minimum, the RhoMobile installer places the Rhodes open-source development framework and the RhoStudio (Eclipse) IDE on the development host system. 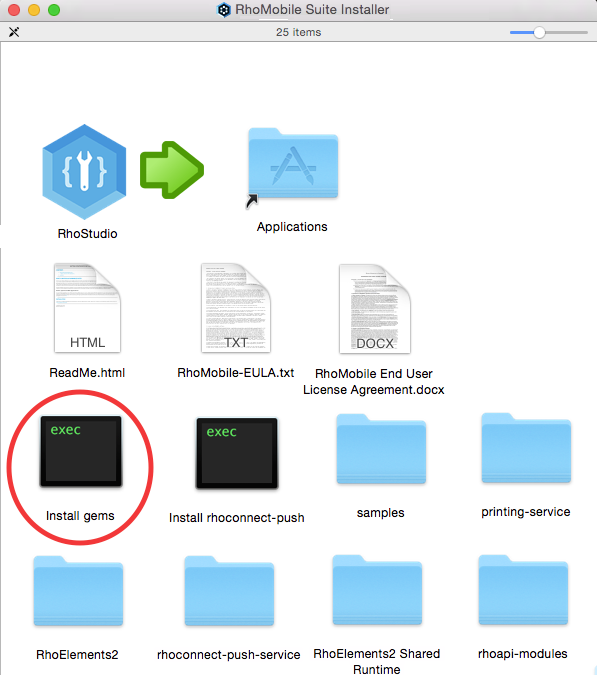 Also included are Zebra’s RhoConnect and RhoElements components, optional modules for creating apps that connect and sync with one or more back-end systems and/or that support Zebra’s enterprise-grade devices. Native SDKs, if desired, are installed separately. RhoMobile depends on Java, Ruby, Git and other tools. Depending on the development host platform, these components are either installed automatically with the main suite or must be installed manually using the platform-specific processes below. Please read and follow all instructions carefully to ensure a trouble-free installation. Upgrading a system that already has a prior version of RhoMobile Suite usually requires fewer steps than a full installation, but still requires you to download the latest software image. If upgrading, follow those steps first. If that fails, try a full installation. IMPORTANT: The update function in the "About RhoStudio..." dialog is currently disabled. If your machine already has RMS installed, get the latest RhoMobile suite for Mac or Windows, then follow the instructions below. 1- Drag-copy the RhoStudio folder from the .dmg to your Applications folder. You’ll see a message like the one below. 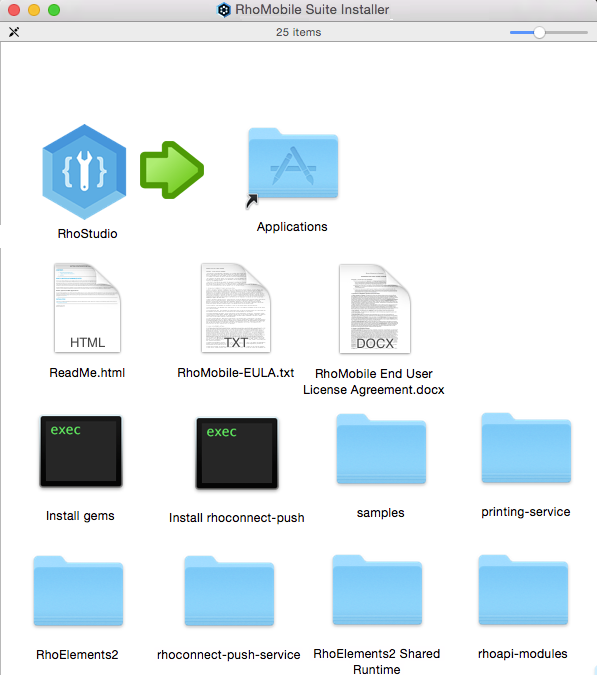 Be sure your ‘workspace’ folder is not in the same folder as the RhoStudio application (by default, it’s in the user’s home directory, not in the RhoStudio folder). RMS 5.1 is NOT compatible with Android NDK 10; Android NDK 9d is recommended. 7- Create or update any application aliases for the new RhoSuite Launchers. If the upgrade steps have failed, or if you’re installing RhoMobile Suite for the first time, follow the instructions below for a first-time installation. Download the RhoMobile Suite Installer for Windows and launch it. This will install Rhodes, RhoStudio, RhoConnect and RhoElements, as well as Ruby and Redis open source tools. Additional installers will automatically launch for Git and Node.js. Follow prompts and read and accept their respective open-source license agreements as appropriate. During installation, certain virus detectors might warn about a “Suspicious.MLApp” security risk in the “rubyw.exe” file. This false-positive can be safely ignored. Since Windows 8.x lacks a Start Menu, a few extra steps are needed to make the RhoMobile launchers visible. 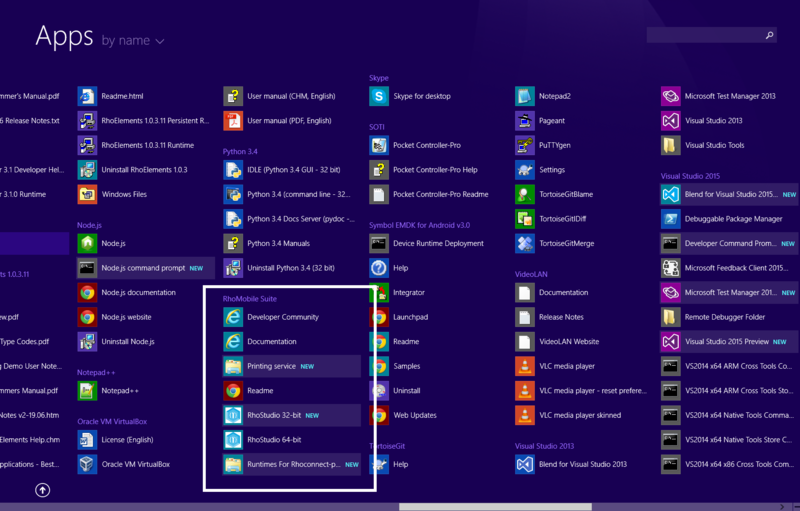 Go to the “Start Screen” of Windows 8 (aka “Metro”) and right-click at the bottom of the screen until the App Bar appears (on Win8.1, the button should appear without right-clicking). Right-click the desired launcher and select “Pin to Taskbar.” This will make it easy to access from the Desktop in the future. Repeat this action for other launchers and for links to Documentation and Developer Community, if desired. By default, the Windows 8 Desktop allows 32-bit applications only. For running the 64-bit version of RhoStudio, see "Notes for 64-bit Windows Systems, below. Additional Windows settings also might be necessary. RhoStudio requires the Java Development kit, which is different than the Java that might already be present for browsers. Unless you’re sure you already have the JDK, visit Oracle’s Java Developer Kit download page and select, download and install the version that’s appropriate for your system. The 32- and 64-bit versions of RhoMobile are functionally equivalent, and there’s no disadvantage to using the 32-bit RhoMobile suite on development hosts with 64-bit Windows. However, if you’d prefer to run the 64-bit version of RhoMobile on your 64-bit Windows machine, you’ll need to manually download and install the 64-bit version of the Java development kit. The Java Development Kit is different than Java versions that might already be on your system for browsers. Visit visit Oracle’s Java Developer Kit download page and select, download and install the 64-bit Java version for Windows. **NOTE:To run RhoStudio, you MUST USE THE RHOSTUDIO LAUNCHERS. NOTE:Before building your first project, you’ll be prompted to create a free account at http://rms.rhomobile.com. Just enter a valid email address and password. The RhoMobile Suite installer for Windows contains Ruby 1.9.3-p194. This version of Ruby is used for executing rake commands on the development host computer and for running RhoConnect applications. Native applications built with RhoStudio use Ruby 1.9.2-p290 on the target device. The Mac OS X installation relies on Apple’s XCode development environment and the corresponding Command Line Tools. If XCode is not already installed, please visit Apple’s developer download site and download and install the version appropriate for your system before proceeding. 1b. Copy RhoStudio to the development system’s Applications folder DO NOT LAUNCH! b. Drag the RhoStudio icon to the Applications folder alias (in the direction of the arrow). This will copy the suite’s main executables and some other useful files to the Applications folder of the development Mac. 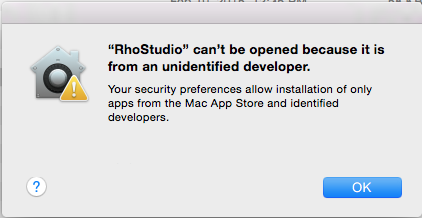 DO NOT ATTEMPT TO LAUNCH RHOSTUDIO AT THIS TIME. Keep the RhoMobile Suite Installer .dmg handy; we’ll refer to it again in STEP 5. RhoStudio relies on desktop Java, which Apple stopped including with Mac OS X as of version 10.7 (Lion). RhoMobile supports JDK 6.0 and higher. Regardless of what you currently have, we recommend that you download the latest JDK from Java.com. This is different than the version of Java that might already be on your system for browsers. Download and open the JDK .dmg, double-click the package within it and follow prompts to install the latest JDK. This step installs a tool called Ruby Version Manager (RVM) that we’ll use to install Ruby 1.9.3. 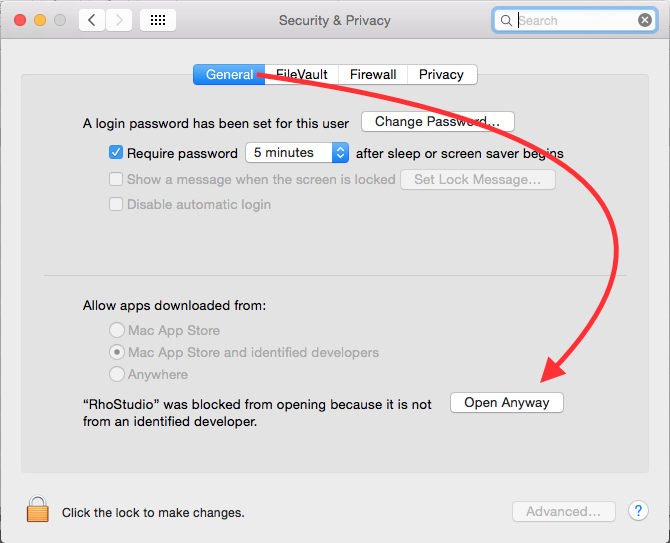 RhoStudio requires Ruby v1.9.3 and is not compatible with any other version, incuding the newer version (2.0) that comes with Mac OS X Mavericks and Yosemite. Fortunately, RVM makes it easy to switch between Ruby versions if you need to later. WARNING: Do not use sudo to install RVM; it can cause problems with file permissions when running bundle commands from within RhoStudio. This command securely downloads the latest stable version of RVM from the “get.rvm.io” web site. Follow prompts and enter information as needed. Now that you have RVM, you can use it to install Ruby 1.9.3 and some other useful stuff. Remember, RhoMobile requires Ruby 1.9.3 and will not work with other versions. This step will not effect existing Ruby version(s) on your Mac, but Ruby 1.9.3 will become the default. You also might be prompted to install homebrew. If so, just hit ENTER to install it in the default /user/local directory. Respond to additional prompts as needed. This step may take a few minutes. Almost done! The final required step is to install Ruby gems. Gems are platform- and processor-specific Ruby apps and libraries that deliver much of the key functionality of the RhoMobile platform. Gems are copied from the installation disk image (.dmg) to your hard drive using a Terminal script included with the installer image. Double-click “Install gems” from the RhoMobile Suite Installer .dmg (below) introduced earlier. A Terminal window will open and execute an installation script. When prompted, select N to avoid using sudo to install gems. This process might take a while; it copies several groups of gems. WARNING: If additional gems are needed in the future, do not use sudo to install them; it can cause problems with file permissions when running bundle commands from within RhoStudio. If you’re given a choice similar to the one below, select option 1. CAUTION: In the unlikely event that you’ve mounted more than one disc image containing gems, it’s important to unmount all except the current RhoMobile Suite version. Failure to do so might result in an improper installation. That’s it! You’ve completed all the required steps to use your Mac and RhoMobile to develop cross-platform applications from a single code base! IMPORTANT: To launch RhoMobile, you MUST use one of the RhoMobile Launchers indicated in the image below. FYI: The 32- and 64-bit versions of RhoMobile are functionally equivalent. Before building your first project, you’ll be prompted to create a free account at rms.rhomobile.com. Just enter a valid email address and password). The installer image also contains files labeled “Launchpad” and “RhoMobile Docs” (scroll down in the .dmg window if you can’t see them). You can copy these or bookmark their links to the RhoMobile developer community and RhoMobile documentation sites. RhoStudio permits development of native apps for Android, iOS and Windows Mobile and Windows Phone 8 on the local development host or in the cloud using Rhohub.com. If you plan to build native apps locally, you’ll need to install the corresponding SDKs for each. For detailed instructions, please visit RhoMobile’s native SDK setup documentation page. Incompatibility between the RhoStudio launcher and the JDK version installed. Go to Window>>Preferences>>Startup and Shutdown>>Workspaces and select a Workspace path that contains no spaces. Launch RhoStudio using either “RhoStudio 32-bits” or “RhoStudio 64-bits” scripts in the RhoStudio folder. DO NOT launch apps in the “cocoa” folders. FACT: The 32- and 64-bit versions of RhoMobile are functionally equivalent.